ORANGE WALK TOWN, Mon. Oct. 15, 2015–An Orange Walk man has been arrested and charged with murder for the stabbing death of a Belize Defence Force soldier during a brawl at Pandas Bar, located on North Park Street in Orange Walk Town, at about 9:00 Saturday night. During the brawl, the soldier was stabbed multiple times in the chest, and he died almost immediately. He was taken to the Northern Regional Hospital, but was declared dead on arrival. Police charged Gian Guerra, 32, of San Francisco Street, Orange Walk Town, with murder for the death of the soldier, Rafael Abel Rivas, 31, of Trial Farm, Orange Walk District. Guerra was taken to the Orange Walk Magistrate’s Court yesterday, where he was arraigned on the murder charge and remanded to the Belize Central Prison until November 26, when he is to be returned to court. 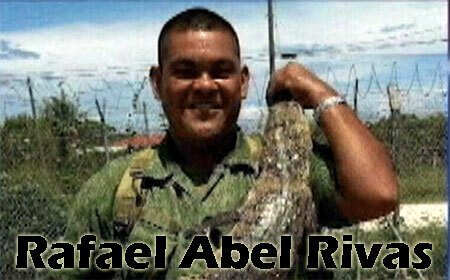 Police said that at about 9:20 Saturday night, they were called to Pandas Bar, where they saw Rafael Abel Rivas, a soldier in the Belize Defence Force, lying on the floor in pools of blood, and that he was already dead after being stabbed several times in the body. Police say that Rivas was socializing at the bar when around 9:00 p.m., the soldier got into an altercation with a man. During the altercation, said police, the man’s companion intervened, and held Rivas from behind, while the man Rivas was fighting with stabbed him in the cheek, chest, arm and abdomen. The two men then fled the bar. Police say that they recovered a knife that they believe was used in the stabbing of the soldier. Their investigation led to Gian Guerra, who was found in the town and arrested. Police continue to search for his accomplice. An autopsy of the body of Rafael Abel Rivas yesterday at the Karl Heusner Memorial Hospital revealed that his death was the result of cardiogenic shock due to a stab wound to the heart. Those who know Rivas said that he was a dedicated and exemplary soldier who was a veteran of 12 years, and was a member of the light engineering company. Funeral arrangements have not yet been made, but he is expected to be buried with full military honors.